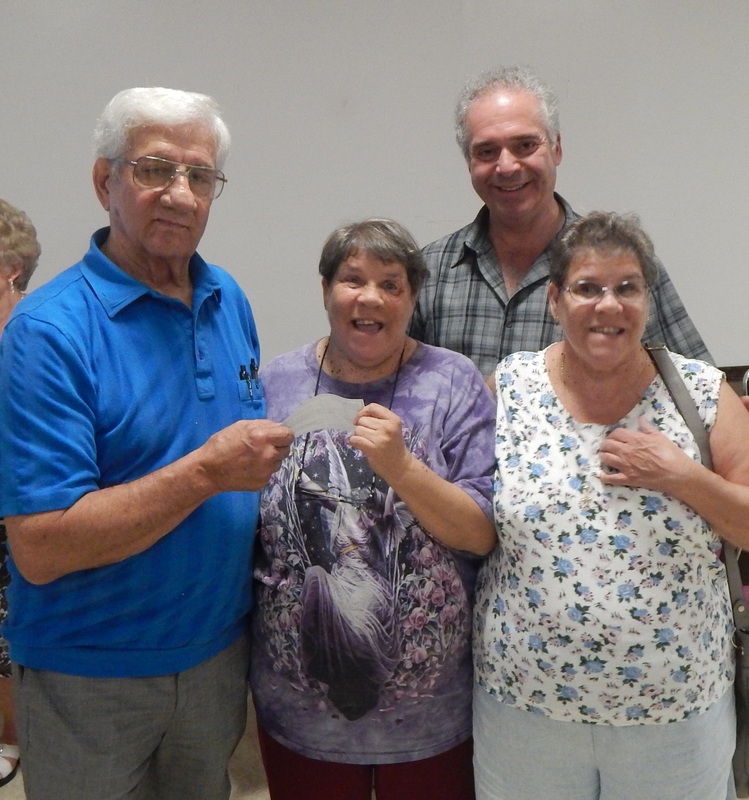 St. Mary’s Benevolent Society held its Annual 20 Week Raffle Party Sunday afternoon at it’s hall near the Hudson River beach in Kingston NY. But with the fabulous spread of food and a chance to win over $2,500 in prizes, attendees were happy to be inside for a few hours. Going far beyond what’s required for affordable housing communities, Birchez Associates is known for its strong commitment to the properties it develops, often adding a number of unique amenities that make residents truly feel special. In August, the company demonstrated this commitment once more with the grand opening of a craft studio at the Birches at Esopus, an award-winning senior living community in Esopus. The studio, dontated by Birchez founders Steven and Judy Aaron, offers a central place for residents to explore their creativity, as well as an opportunity for a club called “The Busy Bee Crafters” to display its wares onsite to support additional projects and local causes. While impressive, the craft studio at the Birches at Esopus is just one example of the company going above and beyond the norm at its properties. Founded in 2002, Birchez Associates strives to find solutions to the shortage of housing for those who need it most in the Hudson Valley. 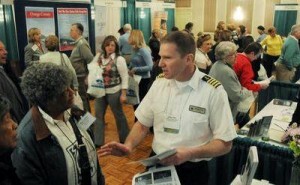 Its team prides itself on offering high-quality, affordable housing to senior citizens, veterans, and workforce families. The company currently manages five properties throughout the region, and it continues to add value to communities long after they open. Ever since Birchez Associates launched, the Aarons have emphasized this commitment to excellence, providing a greater overall quality of life for residents. To make this happen, the company adds amenities usually reserved for high-end, gated community-style retirement living, while maintaining the affordability of its units. In taking this approach, Birchez provide residents with amenities that they would enjoy in their own home. The newly opened craft studio, for example, creates a better sense of community at the Birches at Esopus, serving as a welcoming space that encourages seniors to step out of their apartments and into a more social setting. The property also features a community club area, movie theater, bocce ball court, fitness center, library and game room, where residents can gather and socialize throughout the day. Birchez has been praised throughout the Hudson Valley for their commitment to excellence at each of their affordable housing properties. In addition to a number of amenities, the company’s properties provide aging-in-place opportunities and feature a wide range of green initiatives. As a result of its efforts, hundreds of seniors in our local communities have been able to enjoy more fulfilling, interactive lives. 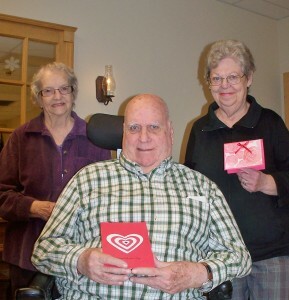 “Long after the Birches at Esopus project completion, Steve and Judy continue to demonstrate their love and commitment to the seniors in our community,” said Esopus Town Supervisor John Coutant. Birchez Associates manages affordable housing properties in Kingston, Saugerties, Ulster and Esopus. 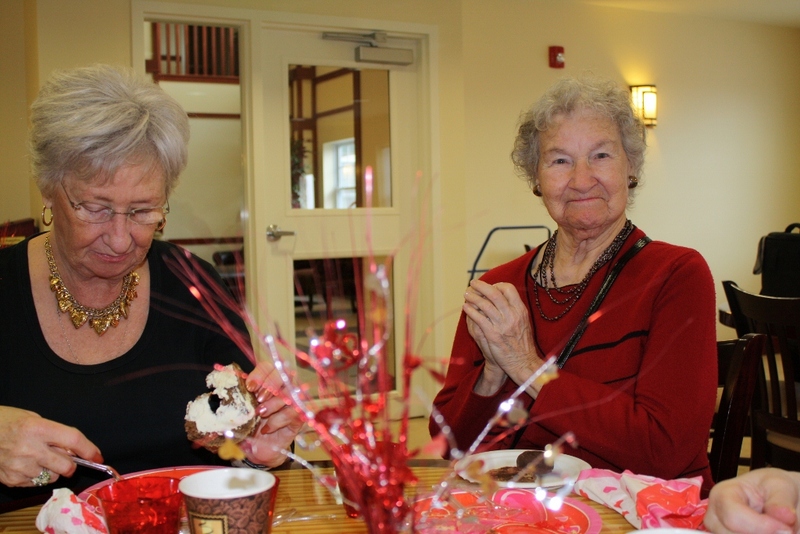 Residents of The Birches at Esopus celebrated Valentine’s Day in style with a delectable brunch of homemade treats, plenty of smiling faces and friendly hugs from a special guest. The Community Room was decked out in style for the event, which was organized by the residents of this premier affordable senior housing community which overlooks the Hudson River. Congressman Maurice Hinchey & Fortunée Bennett. Congressma Maurice Hinchey, who the residents lauded for his longtime support of and fight for seniors’ rights, dined with the residents, listened to their concerns and clearly enjoyed the delicious fare. 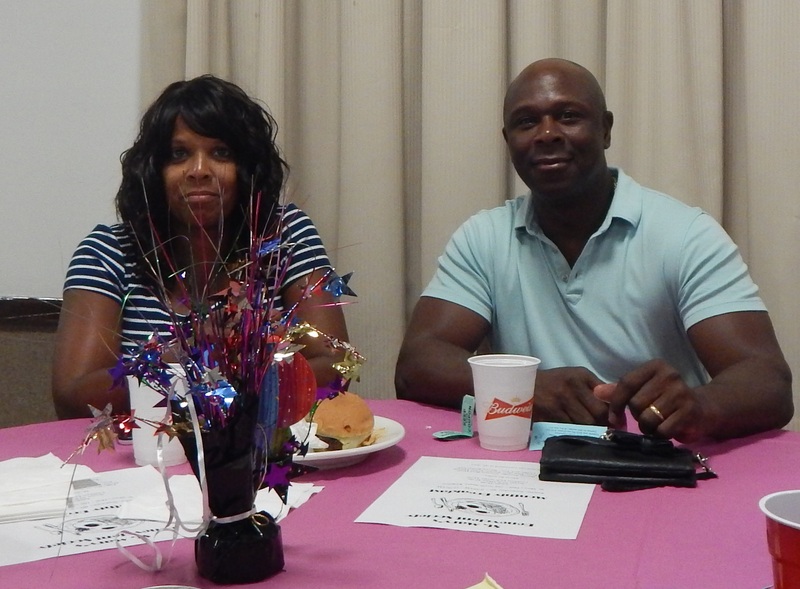 He’s shown to the left enjoying a laugh with resident Fortunee Bennett. Steve and Judy Aaron, who are responsible for this Birchez Associates community, praised those responsible for organizing the event, while delighting in the diversity of the scrumptious spread. 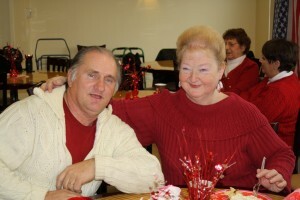 Longtime Valentines Bill and MaryAnn Banks, happily married for 35 years, spoke lovingly about the changes in their lifestyle since joining the Birches community and of the many activities and amenities offered at the facility. 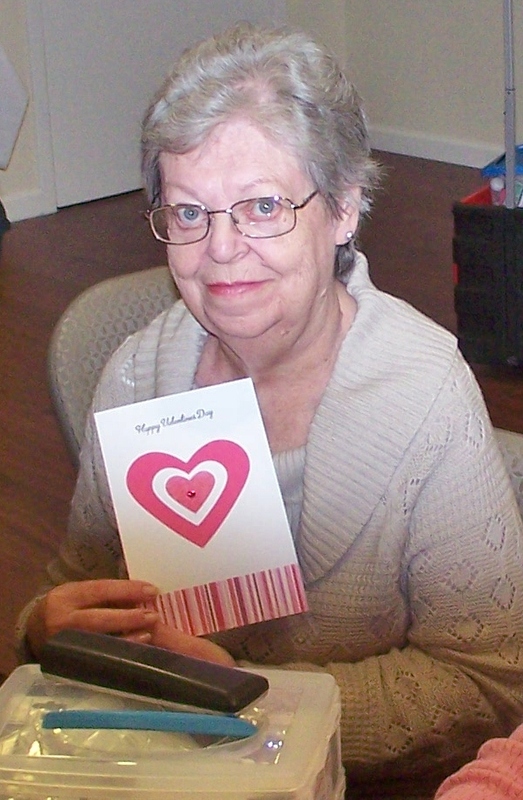 One of MaryAnn’s choices is the bus that comes to the door and takes her for excursions at the Mall (especially when Bill’s working or watching a game!). 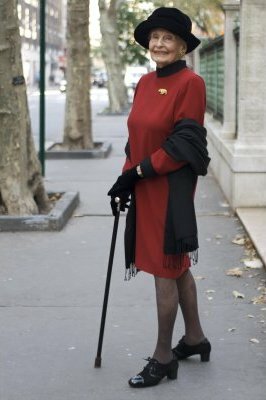 Spry and chic, the 91 year-young Shirley Shumate looked positively captivating in her red Valentine dress. For some seniors keeping in shape comes naturally, but many take advantage of the Fitness Studio, complete with instructor at no charge, at The Birches at Esopus. Eileen McGuire, pictured with Shirley in the picture to the left, is president of the Residents Club at this award-winning facility. 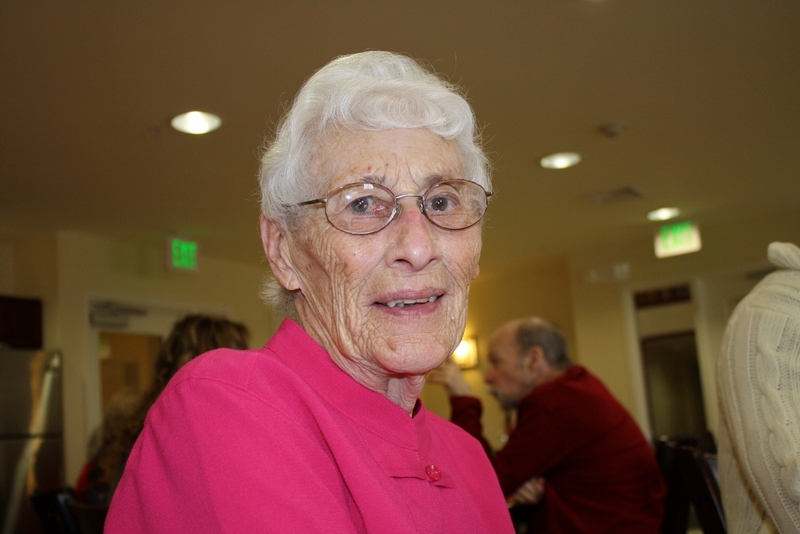 Roseann Harominek spoke glowingly of her new life at the Birches at Esopus – as shown in the picture below, her smile speaks volumes. 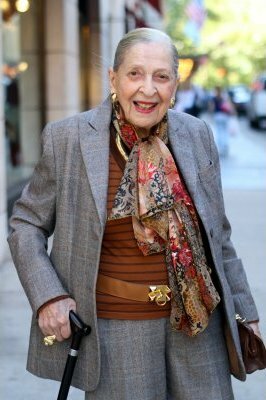 Many who attended were in their late 80s and 90s, fitting tribute to the aging in place philosophy of The Birches at Esopus and other Birchez Associates communities in the Hudson Valley. Pictured is one of two hundred Valentine cards made by The Birchez at Esopus Crafts Club. Birches at Esopus resident and crafter Barbara Fidow shows off a card. 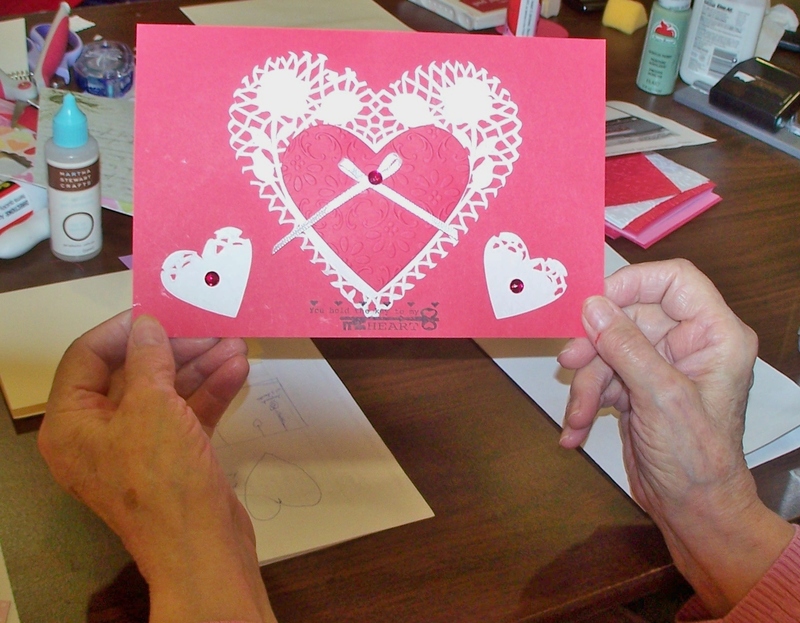 For the last several weeks, a dedicated group of crafters at The Birches at Esopus have handcrafted some two hundred Valentine’s Day cards. And where have they directed Cupid’s arrows? The Golden Hill Health Care Center, Ulster County’s nursing home, located off the Boulevard in Kingston. Started 65 years ago, Golden Hill provides both rehabilitation services and long-term health care. A range of materials were creatively incorporated in these one of kind cards. Ribbons, jewels, doilies, wallpaper, whatever these clever crafters had at hand. Designs varied from whimsical to modern, something for everyone’s tastes. 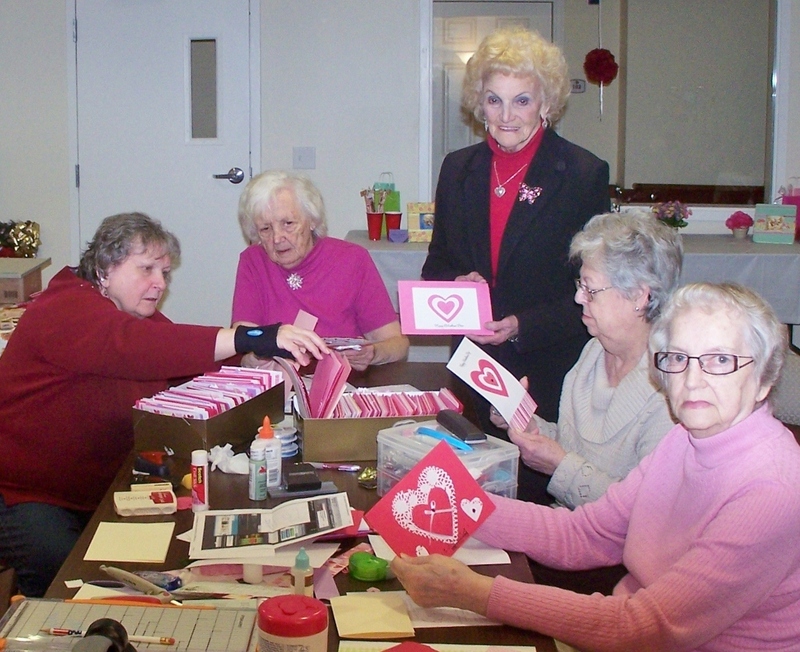 According to Crafts Club member Marie Shultis, this is the third year the Esopus seniors have created Valentine’s Day cards for the seniors at Golden Hill. “If we had one thing to do over, we would have started earlier,” she said. But with a new target of 200 cards this year, their highest to date, they made it with a few days to spare. At Golden Hill, Marie Shultis tells Resident Virginia Burhans how the card was made; Ruby Sterling looks on. On Friday, February 10th, a contingent of the crafters met with a few residents of Golden Hill to present the cards. 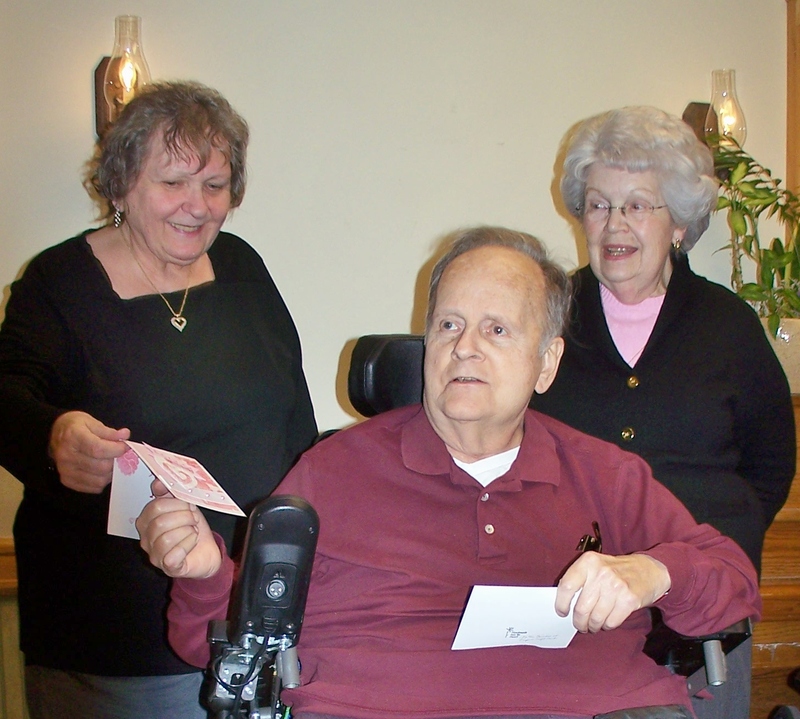 The intent is that the cards could be used to brighten the resident’s room or to give to a loved one. Golden Hill resident Ralph Hayner shows off his pick as Ruby Sterling and Barbara Fidow smile with approval. As The Birches at Esopus group chatted with the residents, there was some sharing of techniques and materials used. Marie Shultis talked about some exacting measurements used in various crafts to make sure the results look as best as possible. Looking at the results, one might even say professional! 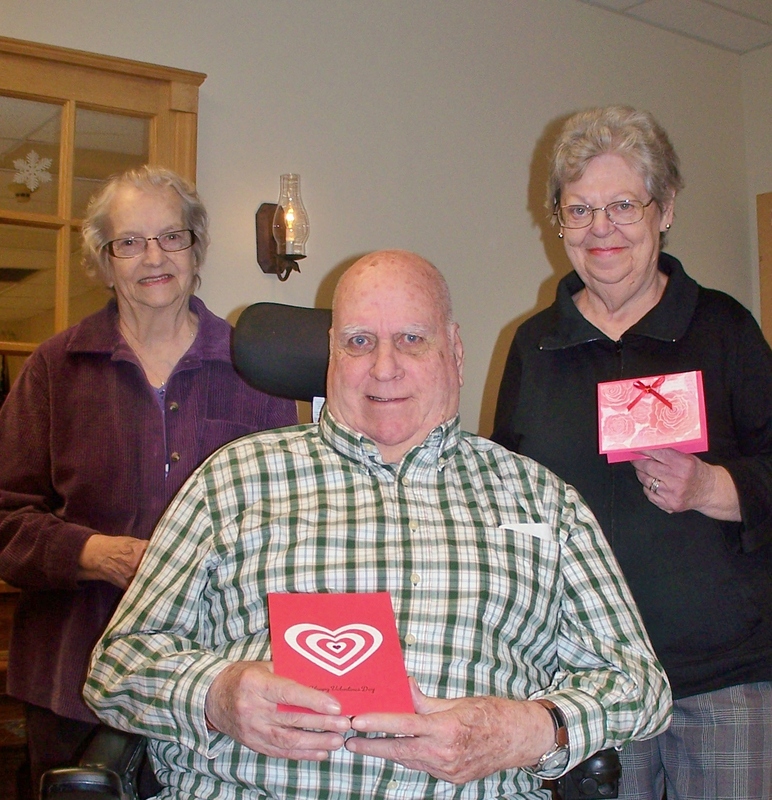 Resident Ken Hyatt has his choice of cards presented by Janis Loring and Marie Shultis. 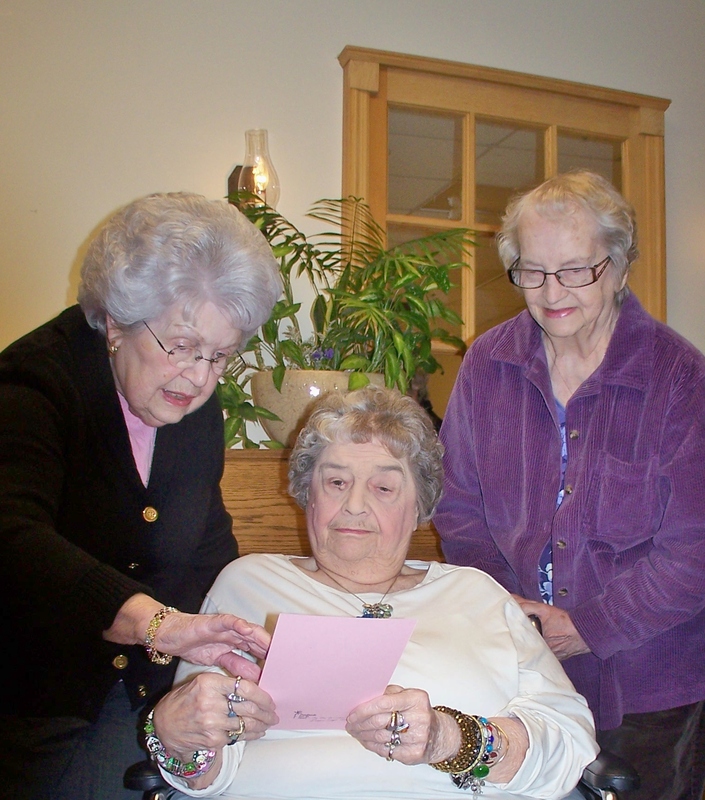 The Crafts Clubs keep busy year ’round at both The Birches at Esopus and The Birches at Chambers. 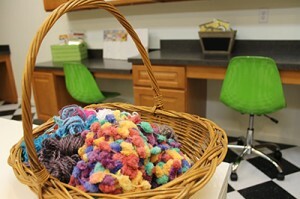 Chambers has had two annual collaborative events knitting hats for children with cancer. At Esopus, the crafts room has shown off holiday gifts ranging from cards, kissing balls, knitted scarves and hats, and at this time of year, lots of red cards. Every now and then the public gets a chance to check out the crafts at The Birches at Esopus. 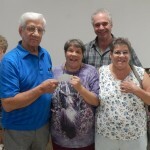 Last year, during the Town of Esopus Fall Festival, the tour bus made a stop at this senior affordable community so interested purchasers could browse the Crafts Club’s creations. We’ll let you know when the seniors have newly created crafts to share. 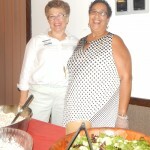 The Esopus Business Alliance (EBA), formed just two years ago, supports local businesses that both operate within Esopus or those outside Esopus which support the local community. Among these is The Birches at Esopus which has hosted a networking mixer for the membership. Now the EBA is holding its second annual celebration with a picnic mixer on June 27th from 5:30 to 7:30 on the majestic lawns of the Hudson Valley School of Massage overlooking the Hudson River. Locate at 1723 Route 9W, West Park, the school is directly across from the Stonehedge Restaurant. Come on out for a special evening. Live (and lively) music features Earl Pardini and his group. Complimentary picnic style refreshments, lawn games, chair massages and mini-facials by the H.V.S.M.T. staff, and a champagne toast to celebrate EBA’s incredible first two years. Non-members and guests are welcome. There will be a $5 per person fee for members and an $8 fee for non-members, payable at the event. This is a rain or shine event as indoor space will be available if needed. Registration is a must. Birches at Esopus residents who would like to attend, please call K.J. 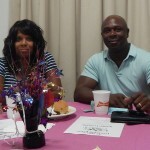 McIntyre at 845-532-7528 or email her at kjmcintyre@birchez.com so we may add you to the guest list. Sounds like a fun event! The Poughkeepsie Journal on April 6th covered the three-day Travel conference that focussed on the mid-Hudson River Valley as a tourist destination. 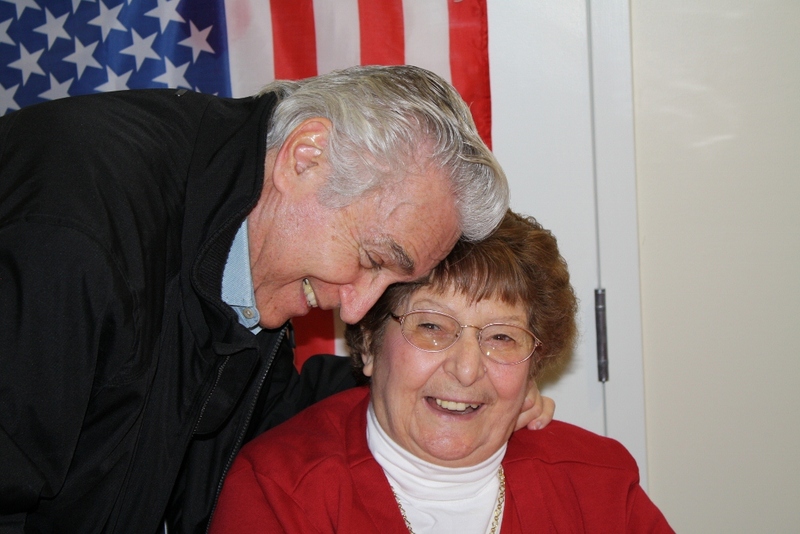 Looking for ideas for The Birches at Esopus Residents’ Club was Mary Jackson, who was pictured speaking with Captain Jeffrey Pyle of Empire Cruise Lines in Poughkeepsie. The event was sponsored by two of the region’s group travel-related companies, Hudson River Valley Tours and Destinations of New York State, and drew tour operators from as far as Ottawa, Canada. Judging from the buzz, we’ll see many of the tour operators back with full buses and boats in the not so distant future. For the full article, click here. PS: knowing Mary, she’ll be available for autographs! Lucas spoke with Crystal Dea Moore, an associate professor and the program director of the social work program at Skidmore College, who is conducting interviews of seniors in the Saratoga area. She has worked with Swedish researchers on quality of life issues as they relate to alcoholism. The forecast is startling: the number of adults over 50 with substance abuse problems will double from 2.5 million in 1999 to 5 million by 2020. It’s easy to see the correlation; changing metabolism, isolation and depression are too often common in the senior population, and all can increase the use and/or impact of alcohol. It’s another reason we encourage an active life style at our communities and feature a senior advocate and others that can keep an eye out for our residents and recommend resources as appropriate. And it’s a reminder for all of us to stay in touch with loved ones who may not have the support system in place that they once had. Locally, Jewish Family Services offers non denominational, home-based, one-on-one counseling for seniors suffering from depression, grief and other symptoms (costs can be covered under Medicare and Medicare Part B). For more information, their website is http://www.jfsulster.org; they can be reached at 845-338-2980. You can listen to the full interview (click here) on WAMC.